After sitting in a metal building in Indiana for many years, the remains of a 1967 AMT Piranha have been purchased and relocated to Illinois. CRV/Piranha website owner, Nick Whitlow, recently purchased the basket case and it now resides in Springfield, Illinois. The car is missing many parts, including much of the rear suspension and most other mechanicals. 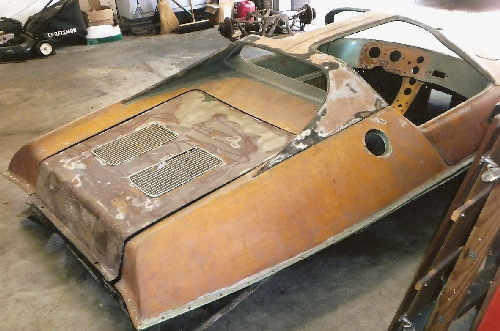 The fiberglass chassis/tub has had several major portions cut away, which means an original fiberglass tub is needed to bring the car back to original. The "gullwing" door tops are also missing. This 1967 AMT Piranha has been partially reassembled by its' new owner. Note the fiberglass "Man from UNCLE" style lower front valance. The car was acquired from Jon Clifton of Ft. Wayne, who purchased it many years ago from Detroit automotive historian Michael Kollins. Kollins got the car in pieces, already missing parts and planned to drop the body onto a Lotus Europa chassis. 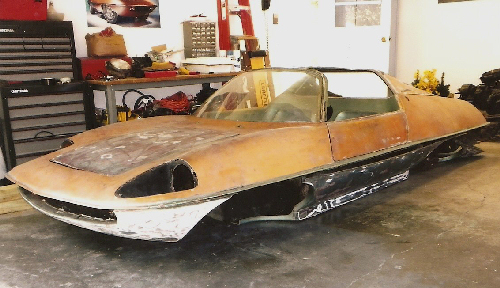 After cutting the fiberglass tub to accommodate the Lotus chassis, work on the car stalled and other projects took over. Eventually the car was sold to Clifton. complete front suspension assembly on the floor in the background. It has been determined that the chassis of this car was originally used for the "Man from UNCLE" car and was later converted to a street car by Gene Winfield and returned to Marbon Chemical when the AMT/Marbon agreement was dissolved. The UNCLE car was reconstructed on another chassis and toured the country on the show car circuit until it was sold on the east coast. The rebuilt street Piranha was painted light metallic green with black seats and a black racing stripe along the rocker panels. The car eventually reached private hands, and for some reason was disassembled and later obtained by Kollins. by Gene Winfield. 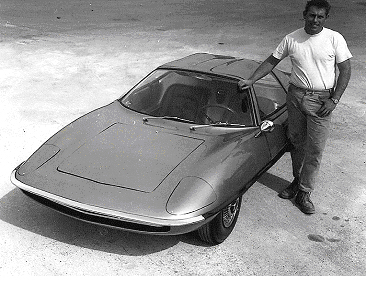 A former AMT employee poses with the car. UPDATE: This car has now been sold to Keith W. of Ft. Lauderdale, FL. It is currently being stored in Georgia, awaiting a full restoration.